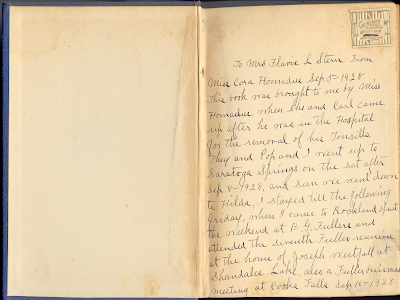 To Miss Flavia L. Stern From Miss Cora Hornadue Sep 5 - 1928. This book was brought to me by Miss Hornadue when she and Carl came up after he was in the hospital for the removal of his tonsills. Written on the front endpaper of "Maria Chapdelaine" by Louis Hemon. Published by Grossett and Dunlap, 1927. I just found your site and I love it. I'm a library book borrower and reader. Also, I create beaded bookmarks. Was just wondering if you ever posted inscriptions! Here's one that goes along with your most recent give-away! Wow thats an amazing job you have. I recive sometimes. But I have never found any old things like that yet.